Missed out on your chance to download Flappy Bird? It's okay. You can just make a DIY box version of the same game. It looks way more fun. That's what Fawn Qiu did. 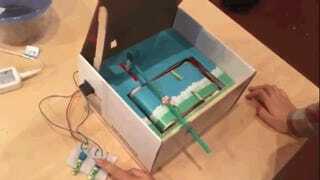 She made an IRL version of Flappy Bird using an Arduino sensor, two servo motors, a reed switch and magnets. Oh and of course the box where it all happens. It's just as hard as the real game! Spotted by BuzzFeed, the IRL version of Flappy Bird (or as IRL you can get without dressing up as a bird) actually looks pretty fun to play too. The level constantly rolls and you dodge them by strategically tapping (just like the game). If you screw up, the box closes itself up until you restart. It's somehow less silly to see Flappy Bird in real life, even though that's infinitely more silly.